I’ve heard a few people complaining lately that you can’t find really good Mexican food in Boston. Perhaps they haven’t tried Zocalo yet. It could be because it’s tucked away on a corner of Stanhope Street in the Back Bay; unless you knew it was there it’s not in a location you’d really stumble across. It’s also on the expensive side, which is not what you always think of with Mexican food. But boy, is it GOOD. I met a friend for dinner at Zocalo earlier this week, essentially for Restaurant Week though I did not order from the RW menu (Janet did). Everything both of us had was delicious and worth the money. For her appetizer, Janet ordered the Ensalada Izabella. It was a beautiful, large salad of baby arugula topped with watermelon, honeydew and strawberries, with a honey vinaigrette she said was really good. 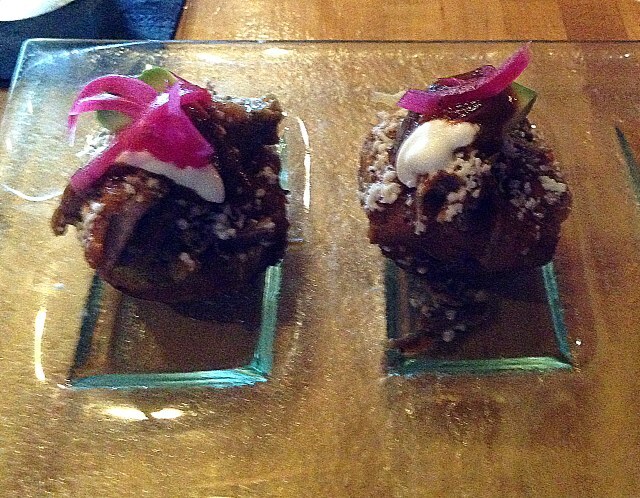 I opted for the Chilapitas, small cups of sweet plantain stuffed with pulled pork, topped with a spicy ranchera sauce, cotija cheese, avocado and pickled onion. There were three of these on my dish (I ate the first one before remembering to take a photo), plenty for an appetizer. However, I totally could have made a meal of these, they were so delicious. 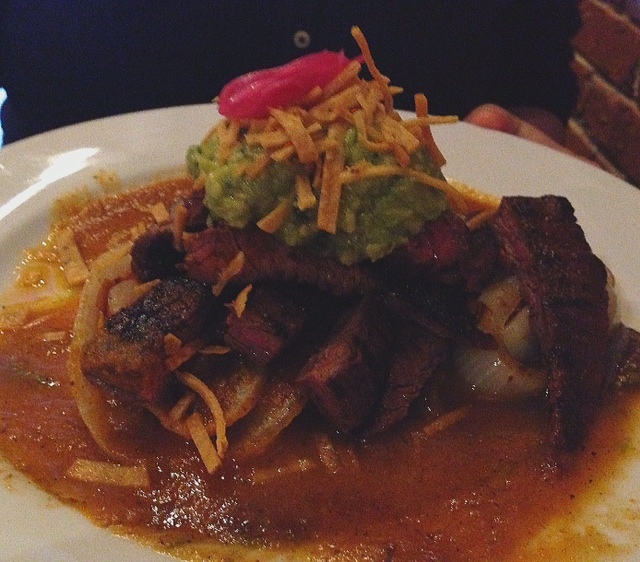 For her entreé, Janet decided on the Beef Pirámide: grilled and sliced skirt steak, tomatoes and onions served on a black bean puree, with fresh guacamole and topped with crispy tortilla strips. Rustic mashed potatoes were served in a dish on the side. 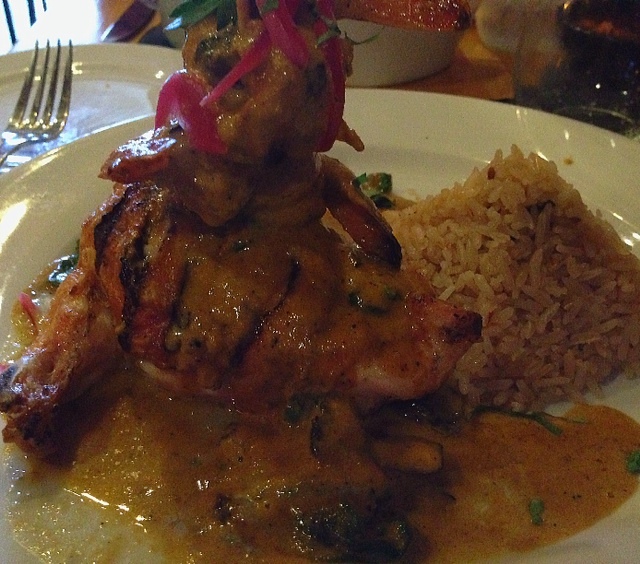 I ordered the Pollo al Chipotle, unusual for me as I don’t often order chicken out – but I was not disappointed one bit. It was probably the juiciest pan seared chicken I’ve ever had, stuffed with spinach and jack cheese, and served on top of an amazing mushroom chipotle sauce. As if that weren’t enough, there were three perfectly grilled shrimp as well, and savory Mexican rice. As Janet was doing the three-course prix fixe, she also had dessert: Mexican chocolate bread pudding, served with cinnamon ice cream, whipped cream and fresh berries. I neglected to get a picture, but it was a large portion and Janet pronounced it a great ending to a delicious meal. 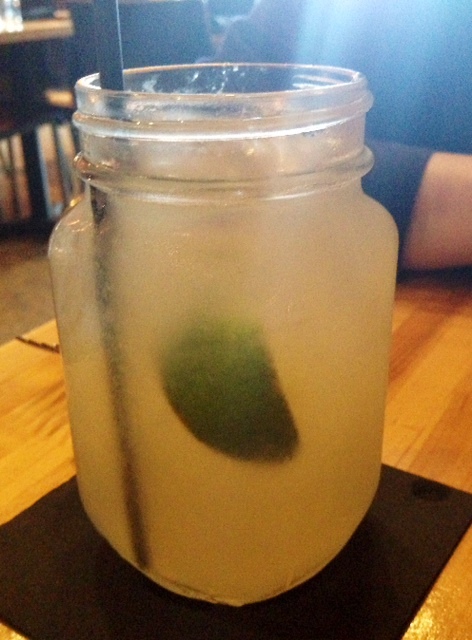 All in all, I would definitely revisit Zocalo, especially for those chilapitas.